The Iowa Space Grant Consortium supports research for faculty at Iowa State. 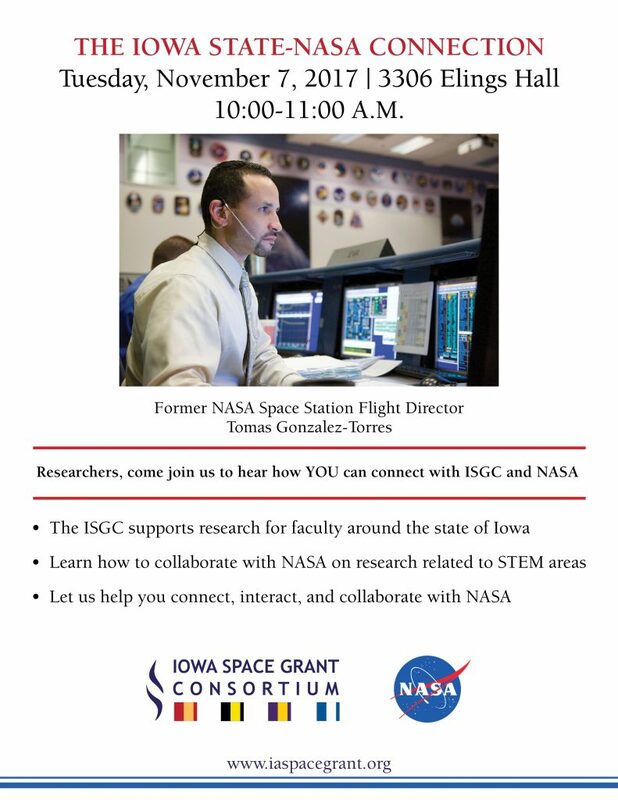 Former NASA Space Station Flight Director, Tomas Gonzalez-Torres will be on campus to speak about how you can collaborate with NASA and ISGC on your research. The Astronauts Memorial Foundation is launching the first certified educator conference at Kennedy Space Center, Florida, July 11-13, 2018. We are currently accepting presentation proposals. Proposals are preferred by NOVEMBER 30, 2017 for priority review. Proposals received after this date will be reviewed based on availability. We anticipate selection notifications by the end of January. Proposers and attendees must be U.S. Citizens. We are seeking interactive and innovative sessions targeted toward STEM that demonstrate alignment with NGSS where possible. Our goal is for educator attendees to depart at the end of 3 days with ready-to-go lesson plans and creative ideas to infuse into their classrooms with multi-faceted, space-related curriculum content. We are also seeking presenters who may be willing to partner with a NASA expert to share real-world NASA projects and discuss how to bring it into the classroom. Presenters will receive a discounted registration rate of $150. Registration will open in 2018. Dr. Christina Bloebaum, interim chair of the Department of Aerospace Engineering at Iowa State University, has been named director of the Iowa Space Grant Consortium, Vice President for Research Sarah M. Nusser announced Tuesday. Dr. Bloebaum, the Dennis and Rebecca Muilenburg Professor of aerospace engineering, replaces Dr. Rich Wlezien, who departs after one year as director. Dr. Bloebaum has been at Iowa State for five years, conducting research in the design of large-scale complex engineered systems. Prior to joining Iowa State, she was the Program Director for the Engineering and Systems Design and Systems Science programs at the National Science Foundation from 2009-2012. Dr. Bloebaum is the 2012 recipient of the American Institute of Aeronautics and Astronautics (AIAA) Multidisciplinary Design Optimization Award and a Fellow of the AIAA. During her time at Iowa State, she has served as Director of Graduate Educations as well as Associate Chair for Research. The ISGC supports STEM research, education, and outreach activities for students and researchers throughout Iowa. The Iowa Space Grant Consortium also strives to inspire Iowa’s future scientists and engineers using NASA resources by funding internships, fellowships, and scholarships, as well as student and faculty research projects and travel to NASA Centers. NASA has unveiled a new splash page and is updating the system for their internship opportunities: www.intern.nasa.gov. The spring 2018 session for internship opportunities will still use the old system: OSSI. (The URL is not changing.) Applications will be accepted until October 17, 2017. The website link for summer 2018 internships will open and can be accessed beginning on October 17, 2017. After this date, all of the internship sessions will use the new system. NASA continues to have unique internship opportunities for students to get involved with NASA-related research. Watch the deadlines, and get your applications in to be considered for these amazing opportunities! 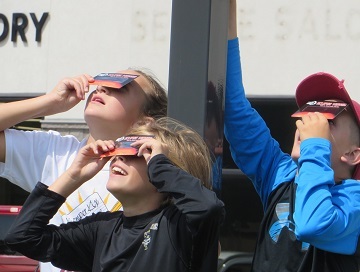 Wearing special glasses or using hand-made, cereal-box viewers, nearly 2,000 young Iowans participated in 4-H solar eclipse day camps across Iowa, including Boone, where ISU Extension and Outreach 4-H Youth Development teamed up with Sacred Heart School. This article was published on Iowa State University’s Extension and Outreach website by Cayla Taylor and Bonnie Dalager. Click here to read the entire article. AMES, Iowa – Iowa State University Extension and Outreach offered over 75 solar eclipse day camps across Iowa. The Iowa 4-H Youth Development program, county extension offices, and partner organizations came together to provide high quality science, technology, engineering and math (STEM) education opportunities to youth for the 2017 solar eclipse. On Aug. 21 nearly 2,000 young Iowans were able to experience a near-total solar eclipse at a local 4-H day camp, a rare opportunity to experience an interesting and scientifically significant event. The youth participants took part in a wide variety of educational activities related to solar eclipses, such as learning how eclipses work and making pinhole viewers for safe eclipse viewing. Technology was also used to feature special speakers highlighting STEM career opportunities. This program was made possible thanks to a partnership between the Iowa 4-H Youth Development program and the Iowa Space Grant Consortium. To learn more about county 4-H, contact a county ISU Extension and Outreach office, or visit the 4-H website, www.extension.iastate.edu/4h. For information on 4-H aerospace projects and events, visit the project page at www.extension.iastate.edu/4h/projects/aerospace.